PolGeoNow presents our first map of Iraq, showing control by the government and Al Qaeda rebels in the country's ongoing crisis. Areas of autonomous Kurdish administration in the north are also indicated. Want to see timely updates for this map? Subscribe to our premium member service! Though the reality is of course more complex, power politics in Iraq often revolve around the country's three largest ethnic groups: Shia (Shiite) Arabs, Sunni Arabs, and Kurds (most Kurds are religiously Sunni, but their language and cultural distinguish them from Arabs). Prime Minister Nouri al-Maliki, a Shia Arab, is often accused of manipulating Iraq's democracy to exclusively serve the country's Shia majority. The Kurds govern a highly autonomous region in the northeast, but the Sunni Arabs who dominate northwestern Iraq have relatively little political power. Into the fray has jumped Al Qaeda in Iraq, now part of the Islamic State of Iraq and al-Sham (ISIS) organization which also controls parts of Syria (map). Al Qaeda has waged a fierce campaign against the Iraqi government in the name of Sunnis, though the group is still rejected by many of the people it claims to protect. 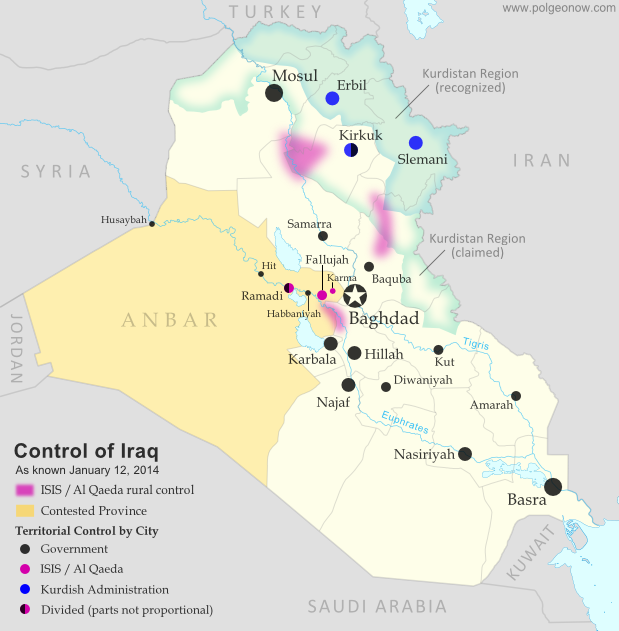 During the height of the Iraqi insurgency, Al Qaeda controlled large swaths of northern and central Iraq, including areas of the capital, Baghdad. Over the next few years it lost most or all of its territory, but has recently been making a gradual comeback. A map from the Reuters news agency last month shows a surprisingly large number of areas apparently under Al Qaeda's influence, though scholarly research from the Institute for the Study of War determined just three major areas of control for the group (shown with shading on our map). Things changed early this month, when a botched government crackdown resulted in Al Qaeda fighters taking control of the two largest cities in the western province of Anbar. It started when Prime Minister Maliki ordered the army to clear a one-year-old camp of Sunni protesters in the city of Ramadi, which he claimed Al Qaeda was using as a base. After clashes with enraged local militias, Maliki agreed to withdraw the army. But soon after he did so, Al Qaeda launched a large-scale attack on Ramadi and nearby Fallujah. The army returned, and a three-way struggle ensued between government forces, Al Qaeda, and local militias who supported neither. On January 3, Al Qaeda fighters of ISIS declared Fallujah an independent Islamic state, and both Fullujah and Ramadi were reportedly under partial control of the militants. By the next day, they were said to be in nearly full control of Fallujah, as well as the nearby town of Karma. ISIS also apparently captured several other towns along the Euphrates River, but a few - including Hit, Habbaniyah, and the Husaybah border crossing with Syria - were quickly retaken by the Iraqi army. Still, to control Anbar's two major cities is to dominate the province as a whole. And although government forces have been making steady progress in retaking Ramadi, at least 10% of the city is reportedly still under Al Qaeda control. Fallujah still remains in rebel hands, though some local leaders claim that power is held by local militias rather than the ISIS/Al Qaeda fighters. Categories: al qaeda, asia, autonomous regions, conflict zones, divided countries, free conflict maps, iraq, isis, kurdistan, original maps, rebel control, the "islamic state"